Cons - ??? makes me want to build a full system? An old friend and I have always had the "dilemma" of bridging the gap between what we want and what we need - especially when it comes to the finer things in life. Do you "need" to special order your BMW from Germany - probably not (although he decided to). Do you "need" to drink 30 year old scotch - probably not, or at least not all of the time (guilty as charged). Enter Justin from ampsandsound, the Kenzie, and my introduction to the audiophile end of the spectrum for audio equipment. Justin took the time to describe what his company and products are all about - I was immediately interested. His passion is not only obvious when talking to him, but is visible in the attention to detail in his equipment. I won't go into technical specs, all of that information is easily found elsewhere. I am very much a numbers and technical specs kind of guy, but after experiencing the sound quality and warmth of the Kenzie, the numbers and spec sheet no longer matter to me. I am hearing things in the music I have been listening to for years that I haven't heard before. The clarity, the warmth, and fullness of the sound isn't easily described with words; at least, words don't do the sound quality justice. The details I am now hearing has made my entire music library feel new again and I'm excited to listen through it all to find the "new" parts I've been missing. Add the Kenzie to my list of items that filled a "want" and quickly evolved into a most definite "need". Cheers Justin for building an amazing product at an accessible price point such that my discussion of wants and needs will continue on. Pros - Build quality, footprint, tone, looks! Cons - Headphone jack placement (sort of). ampsandsound has made quite a name for itself in the last few years. I remember the first time I saw pictures of Justin's classic designs and honestly, based on looks alone, assumed they'd never be in my realm of affordability (and in seeing some of his more recent releases, still aren't lol). I however, am very happy to say that I've recently been able to purchase one of Justin's personal units and I'll just say it... I'm out head-fi! Read on to see why this guy ticks every box for me. Sound: In a word: tone. In discussion with Justin about the differences between his headphone amps, the word he used to describe the Kenzie first was the same. It's not particularly colored one way or the other, but because of it's no-feedback nature, can be swayed one way or another, whether by cables or tubes. In every experiment though, all of my listening selections were marked by a richness that was hard to deny. I don't know if I'd say smoothness, but to steal a word from the world of photography, everything had just the right amount of saturation. Thoroughly enjoyable with every song. Bass: The low end on this amp is wonderfully clean and full. My headphone of choice is the original Grado PS1000, which has quite a bit more heft than just about every other Grado. The Kenzie strikes a great balance of thickness and control. With some amps I've owned, the PS can get a little too plump and cover the low midrange. Not the case here. From the kick on "Happiness" to the upright on "Strasbourg, St. Denis" everything in the bottom was tightly controlled yet unrestricted. It bears mentioning that I had the same experience with the GH1, HD58X, and an auditioned LCD3. Mids: Sorry for the redundancy, but the word here is rich. I've had a MAD Ear+HD and Mainline during at the same time as the Kenz, so there's been plenty of tube-goodness to go around. The Mainline has a certain smoothness that was undeniable, and the MAD already has plenty of rep for it's tube-tastic flavor. Where the Kenzie differs (to these ears at least), especially with a few NOS tubes is that it maintains a noticeably better balance between smoothness and detail. The harmonized vocals from Highlands Worship's recent release were easier to separate but still sounded very natural and coherent. The same would apply to the horns and keyboards from the Snarky Puppy tune. So much fun! 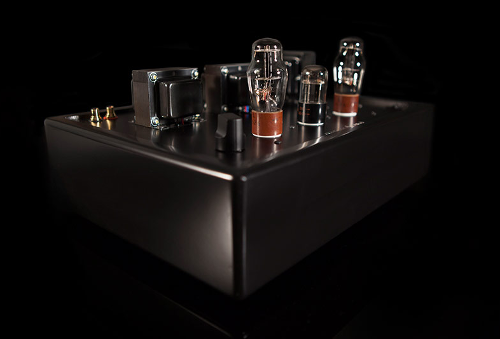 Treble: Best balance in the upper range I've heard from a tube-design headphone amp. One of my make-or-break song for testing the upper end is "Grown Folks" by Snarky Puppy. There are trumpet/keyboard stabs throughout that are wince-worthy with the PS and less-refined or otherwise treble-tilted source gear. With the Hugo 2 alone, the upper end on those licks brushes up to the edge of my comfort. Running the Hugo into the Kenzie took just the slightest edge off, even at high volumes which is exactly where I like it to be. The MAD nor the Mainline accomplished that; they traded clarity for smoothness or sacrificed the latter for a little peakiness. Soundstage/Imaging/Separation: Great! I've heard wider on a few occasions, but what I like about the presentation here is that the separation from left to right is strong AND the front to back is there. In my experience, usually you get one or the other. The Hugo alone offers TOTL separation, but adding the darling circuit really does something special with the front to back imaging. Well-done orchestral and jazz recordings really came to life when the tubes were added in! Aesthetics/Build Quality/Accessories: Su. Perb. Volume pot is super smooth. Plugs are tight. Fit and finish are all super clean. Frankly, I love the classic look and feel of this amp. Everything looks and feels well-made and I'll be honest, I feel a little bit like I've arrived with this piece of heirloom-quality gear on my desk. Thanks Justin for committing to your gear truly looking as good as it sounds! Final Thoughts: All in all, the Kenzie is a beautiful, well-made, tone monster of a tube amp that deserves consideration from anyone in the market for an heirloom-quality piece of kit. For dynamic headphones, it's got all your bases covered (have heard it may not be there for hard to drive planars but I don't have any of those). I certainly am a satisfied customer and wholeheartedly recommend it! Thanks for reading! Thanks to Justin of AMPSANDSOUND for sending me this amplifier for review as well as always being super kind and willing to answer all my questions. The Kenzie is a little but serious amplifier made by AMPSANDSOUND that is the company’s first foray into the headphone world. The company first began making speaker amplifiers where it added a headphone amplifier output to one of it’s amplifiers. Later on they decided to answer the call for a dedicated headphone amplifier and now we are here with the Kenzie. It’s bigger brother, the Mogwai, came full circle being made with the intentions of offering more power for other headphones that the Kenzie is not ideal for but also the ability to power loudspeakers. In another review I covered the Mogwai which is an amplifier I purchased because while in my stable next to the Audio GD-HE-9 I found it more to my liking. The Kenzie amplifier aims at more specialty and less versatility. As of recently I have had quite a penchant for high impedance and low impedance dynamic headphones. I wanted to hear how the Kenzie handled those loads and what this little guy is able to bring out of my music. I am very pleased to be able to share my honest opinion of the unit with you. Do note that no tube rolling has been done during the Kenzie’s time here so all impressions are from stock tubes. Input Sensitivity 520mV peek for full power out. The Kenzie is a no frills, simple wood and fire amplifier. It is not nearly as flashy and impressive looking as my Auris HA2 SE but the build is solid and the while I think a glossy finish makes wood look more sophisticated it doesn’t go with all designs and personally speaking in this case I think it looks just fine. The Kenzie pot is smooth as butter with excellent resistance to ease of turn ratio. 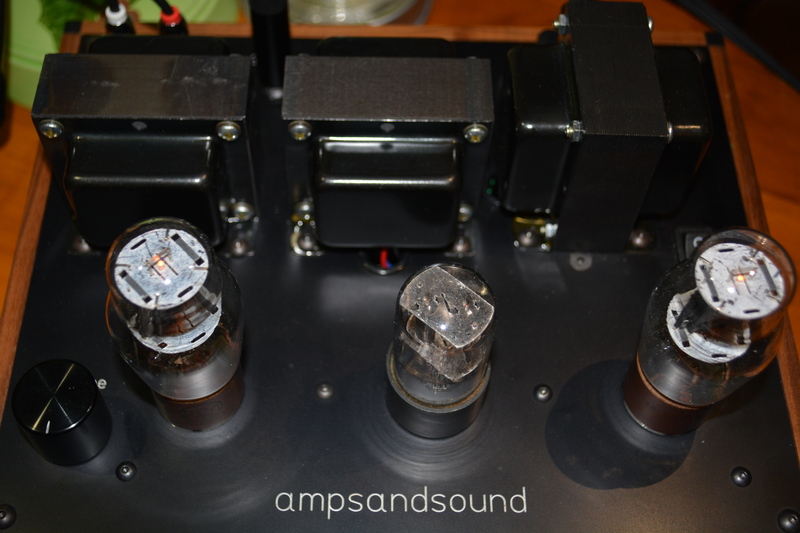 The pot is located in front of the amplifier while the inputs and outputs are in the back. I had no issues dialing in my ideal volume. 600ohms output: This is where the Kenzie shines. A 300ohm output seems more logical but the 600ohm output worked beautifully with my HD650 and ZMF headphones. To spoil the review right here is fine to me as I am not sure you are here to read me carry about. Plugging my Atticus in revealed some of the best midrange tonality and realism I have heard under 2K easily. It opens the mids up like a uncaged bird with new wings. 32ohms output: Nothing to snuff at. Judging the Kenzie from using this output doesn’t really reveal what it is best at. It kept composure but sometimes I felt there to be a slight lack of dynamics and openness relatively speaking. For example I actually sometimes prefer the Mogwai with it’s 32ohm output, especially with planars due to it’s more powerful nature. The options and variety of the chosen type of tubes for this amplifier are somewhat limited. I am of the believe that other tubes can alter the sound but if you purchase a Kenzie I wouldn’t have high hopes of doing a whole lot of tube rolling. The 600ohms output’s wonderful sound comes with a small price, some slight hum when no music is playing. This is less loud than my Auris when using it’s high impedance output but still audible. Luckily there are a ton of headphones out there that the Kenzie can drive very well but with my HD6XX I am just a tad higher on the pot than I am used to, though there is plenty of headroom. Also I would stay away from hard to power planars like a T50RP Mod or HE500. Sure those headphones will sound good tonally with enough volume but they will also sound a bit compressed and flat in dynamics. My Odin is efficient but would like a little more power to allow it to open up. The Atticus and Eikon have no issues whatsoever, nor will your Utopia and Elear. I do believe LCD2, X, or 3 would do fine. The more amps I come across the more I have come to terms with the fact that in order to get the ideal sound you want you have to be selective of each component and know what meshes. That is obvious but in the case of the Kenzie, had I not had a high impedance headphone to test it with, I feel I would have deemed it good, great even, but not anything special compared to what I have on my desk now. The Kenzie is a beautiful sounding amplifier. During my testing I found the Atticus to pair best with it so that is where most of the impressions below come from. Some pairings were not punchy, some were not; some pairings were amazing and some decent; yet none were a failure unless they called for lots of power. Even then tonally the Kenzie could never be to blame, sans a dismissable tendency to highlight the upper midrange of my HD650. The sub bass of the Kenzie has good extension. For EDM and such the Kenzie has enough reach and presence in the sub bass for one as my self with a health appetite for low frequencies to settle. I often listen to a lot of the less mainstream artists like MNDSN or Eric Lau. On Eric Lau’s ‘Rhythm King’ I find the bass kicks to have excellent focus that cuts through the sub bass sustain notes even more than my Mogwai and Auris. It has a natural but quicker decay than either of them sounding a little more dry yet not solid state dry. Still and so it rumbles and growls just slightly less than either of them. It has less heft and bang than the beefier sounding Mogwai and is a little less hard and dense than the Auris. I previously said in another review that the Mogwai is tight and focused but the Kenzie reveals otherwise sounding a little more precise and defined but a little less heavy and thick. The Mogwai is a little less focused and could stand to be just a little tighter like the Kenzie. The bass is linear to my ears without any accentuations to speak of; it sounds neutral without any of the baggage that usually comes with that term. If you are looking for elevated bass I don’t think the Kenzie is the one and may even call it a hair below my personal ideal amount. On the Kenzie’s 600ohms jack I find the Atticus to sound more controlled and punchy than it does on most other amps I have tried with it. Also it is exceptionally responsive. Straight up…the ‘King’ of mids for me so far in its price bracket. That is with the following in mind: Trafomatic Head 2(now outside of its price bracket at over 3K), the SPL Phonitors, stock Mogwai, Apex Sangaku, my Upgraded Mogwai (better mids than stock], Auris HA2 SE, iFi Pro iCan, Cayin iHA-6, Wolf Ear Makoyi, Audio GD-HE9 and other lower tiered gear. Now I can’t make that statement without disclaimers. Firstly, that is with the high impedance output where I hear a distinct openness for vocals that I have only really heard before on one other amp: the Audio-GD HE-9. The Audio GD had this aspect under its belt with even more transparency and a much blacker background but it was not combined with the proper amount of tone density needed to make it sound as realistic as the Kenzie does. Swapping from the SPL Phonitor E and I hear the same amount of clarity if not just a little less than the SPL, similar ‘hear through factor’, a very similar tonality and resolution, but more depth, body, resonance, and organics. The Kenzie does not sound overly thick, warm or syrupy in the midrange but full, resounding, and open. The Mogwai (upgraded caps) has a little more sweetness to it in the lower mids with the stock tubes but is less clean cut with it’s edges; more round and just as clear but not as open and vivid. Listening to Livingston Taylor “Isn’t she lovely” I hear good dynamic range and the guitars have resounding tangibility. His voice is more believable on the Kenzie than my other amps. Hand percussion sounds bold and resolute with tangible and solid leading edges. Now using my HD650, I find that I sometimes prefer the heavier and denser timbre of my Mogwai. I personally like to throw some meat on the HD650’s bones which is why I love it so much with tube amplifiers and in this case the Mogwai. I can also swap tubes and reel in a bit of its tendency to sound a little shouty to me at times with the Mogwai. However, the 650 still sounds more open and expressive on the Kenzie, and while it has a little less body, it is sounds deeper and better projected. I am sensitive to the HD650s upper midrange though so at times it is a bit much for me even on other amps so I listen with the Senns at a lower volume because the Kenzie can lightly highlight this aspect. The lower midrange sounds flat to my ears without any extra warmth. The middle midrange is spot on and the upper midrange or higher end of the middle midrange is just barely accentuated. I find the Mogwai and Kenzie very similar in treble performance. The Kenzie has excellent resolution just as the Kenzie does but I feel the Mogwai is a bit more raw and resolving up top than the Kenzie. I can hear the echo trails of cymbals better on the Mogwai over the Kenzie just slightly. The textures of the Kenzie are not smooth or dull and provide decent bite even compared to some solid state amps. The balance is pretty even without any hard spots in the lower treble. Extension seems a very small bit better than the Mogwai which leaves me with no real complaints. I find the SPL Phonitor to have just a little better extension than the Kenzie. The upper treble has more presence on the SPL Phonitor E that sounds a little more neutral and evenly balanced to my ears but not by much at all. The Kenzie is a less punchy and snappy sounding amplifier than my Auris HA2 SE that drives rhythm a bit better regardless of impedance due to its harder bass and excellent dynamics but with a high impedance headphone the Kenzie is not far behind and sounds more open with better depth to its images. I still feel the Auris is a better all arounder because it can do some planars decently and regardless of the pairing it exhibits these traits whereas the Kenzie is a little more finicky with the headphone you plug into it. But the right headphone into the Kenzie sounds like you are unlocking the paid for version of your favorite song instead of listening to Spotify it is also more resolving than the Auris. The Micro-Dynamics are pretty good on the Kenzie but the way the midrange blooms, swells, and drops in volume makes it’s Macro-dynamics take precedence as one of it’s notable attributes. I found my Atticus, and HD650 to sound more dynamic in the mids on the Kenzie than my Auris, Mogwai, and the SPL Phonitor but the Odin and Meze to sound more expressive on the others over the Kenzie. Do note though that the Kenzie still had better hear through factor with them and still was decently charismatic with the Meze Classics as there is no sense of compression with the Kenzie. Soundstage on the Kenzie is actually smaller than my tweaked Mogwai, mostly in width but depth seems to go to the Kenzie but just a hair. The Mogwai(with upgraded caps) soundstage is more even, with less height while the Kenzie has better separation since it sounds less wet and also has slightly better height. I prefer the soundstage of my upgraded Mogwai overall though. I feel my Auris is just a bit better at layering and making the images sound emboldened in their positions but the soundstage sizes between the two (Kenzie and Auris HA2SE) are similar. All on it’s own I feel the Kenzie is pretty good with staging that is naturally holographic. Attacks and decay are fairly good having me wishing to re-evaluate my Mogwai which (again) is comparatively slower in decay and less sharp with attacks. The decay and tone density of the Mogwai give it a thicker, more lush, and full sound. The Mogwai sounds more round and smooth in the bass and midrange attacks. Piano keys wallop with good timbre and body but have slightly less physicality to them than the Mogwai or Auris does but not by much. Tone Density is actually a little more on the Auris and Mogwai so they sound just ever slightly more visceral than the Kenzie. Specifically in the bass where the Auris HA2 SE sounds harder and the Mogwai heavier. While just slightly less dense the Kenzie never sounds thin to my ears, especially compared to solid state amps. Resolution is pretty good on the Kenzie. Small details are something I find it to pull out better than Auris HA2 SE by just a bit. Given they are the same price almost I would have to say that the Kenzie has slightly better sound quality. ZMF ATTICUS – The best I have heard it so far. Sure the Auris HA2 SE gives it more drive and a sense of nuance but it doesn’t make it sound as open and still the Kenzie is punchy making my Atticus sound crisp and defined. It is a very engaging pairing as well and is able to reveal how lively and potent the Atticus can be on the right amp. SENNHEISER HD650 (MODDED) – While it plays a little less gently with the upper midrange of the HD650 it still sounds really good with it. It gives it good punch, an expressive sound, and highlights its strengths; taking it to new heights. KENNERTON ODIN – This pairing has good tonality but is not really as dynamic as I am used to hearing it on my Mogwai. My Mogwai opens the Odin up more and gives it better body. Also on my Mogwai the Odin sounds really natural and just as clear as the Kenzie. I find the Odin easy to get it to sound loud with a lot of room on the pot left on the Kenzie at just 11 o’clock on the dial for those songs I want to turn up but it sounds compressed compared to the others on my desk. FOSTEX T50RP – My mod has a bit extra in the presence region and the Kenzie is not powerful enough to cut it. Sorry it’s just not. It is possible that there may be some better sounding headphone amplifier at 1700 for my favorite closed back – The Atticus – but I haven’t heard it. The Kenzie has very good tonality and realism from pleasant tube distortion and is a little more clean cut when handling transients than some of the other tube amps I have heard around it’s price. I think it works well for high impedance headphones and does above average for low impedance headphones as well. To put it this way may help understand the Kenzie. When I try low impedance headphones on the Kenzie it is not that I do not think they do not work well, in fact I find the Kenzie to be competitive with any amplifier around its price unless you need lots of power. But the way it opened up my 6XX and especially my Atticus was special in synergy. Upon first plugging my Atticus in the Kenzie I wanted to get rid of my Mogwai so I could have one but I prefer my planars on the Mogwai and to a lesser extent the Auris and since hardly any amplifier does it all then synergy is the name of the game. It’s obvious that I like the amplifier. It is tough for me to critique it’s sound quality and I have already been recommending it. If you are building a rig around anything like a Senn, Beyer, ZMF Dynamic, and even some low impedance dynamics I think the Kenzie is worth considering for sure. To really hear the Kenzie at its best you should replace the stock 12SL7GT input tube with a 1960 vintage Telefunken "Diamond Bottom" ECC801S using an adaptor readily available on eBay. If you can find them the rarer Tung Sol 1626 also better the NOS RCA the Kenzie ships with. 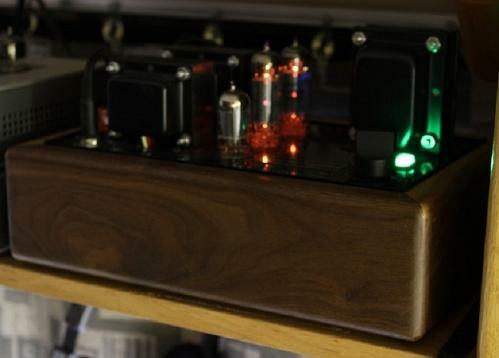 An excellent "summit-fi" tube amp which is gorgeous to look at! Pros - Quiet, affordable, gorgeous, warm quality sound, fairly powerful, TUBES! The Kenzie is handmade in Southern California with U.S.-sourced parts and custom hand-wound output transformers from Transcender, out of Hollister, CA. My first thought honestly, after I carefully put the tubes in and turned the unit on; was “It’s alive,” like in Young Frankenstein and the immortal words shouted by the great Gene Wilder. It had a Frankenstein-like look, or maybe it was the lab. I do not say this to insult, but to state that I was venturing into something, which was new to me. My current hybrid-tube amp is the small but quite nice Nobsound NS-08E. I do enjoy that hooked to my iPhone, but this was an entirely different level of creature here, to say the least…Built from the excellent Darling Ciruitry, along with tubes originally produced from the WW2 era, there is an excellent "old meshes with new" formula to pay homage to that historical era where tubes ruled. I am thoroughly entranced in tubes now, and would love to delve into this category of amps more as a result. Lyle Lovett is an example of another bridge to that era and as such, his music is very fitting for the Kenzie, which harkens back to another era when tubes were tops. 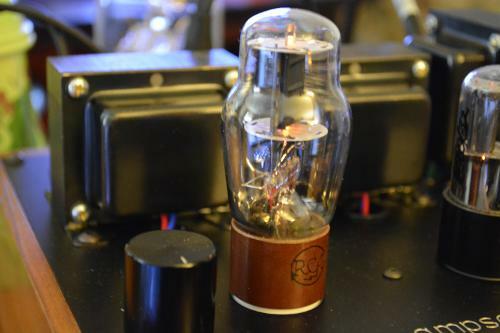 While they never really went out of style, tubes became reserved for the (apologies, please) ridiculously high-end equipment. Witness McIntosh components. They have been around since 1949, when founder Frank McIntosh developed his own wares after consulting in the early TV days. 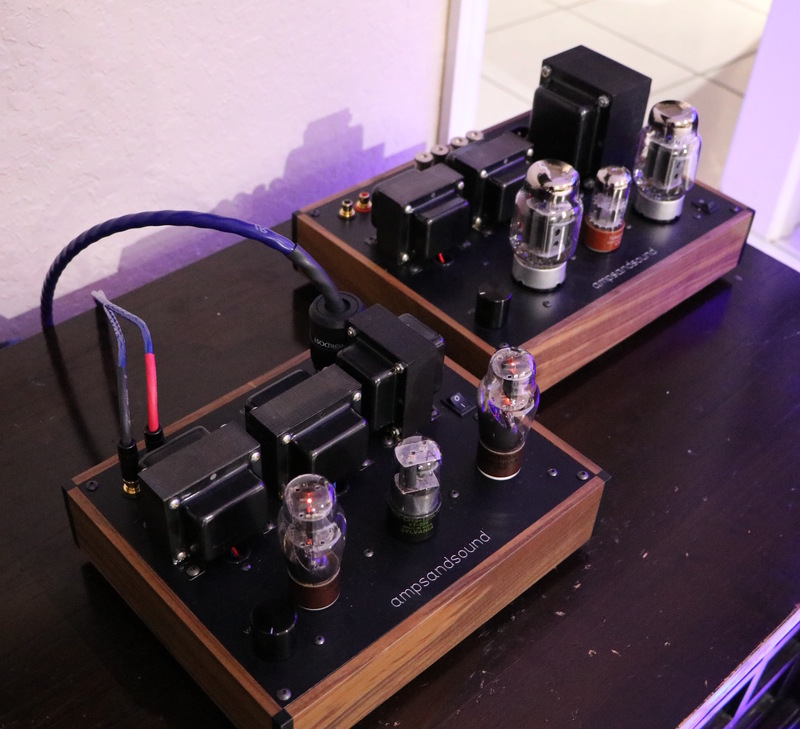 With the help of Gordan Gow, they developed their wares into the infamous patented high power/low distortion amp. The rest is history, as they say. I mention this for two reasons. 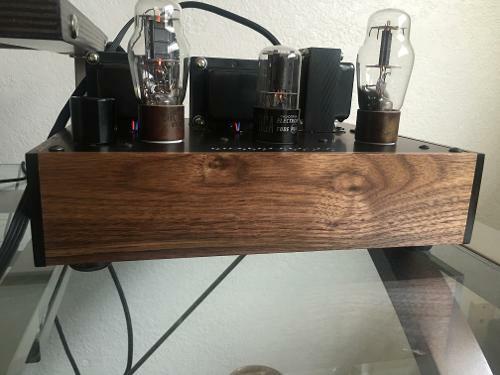 Ampsandsounds founder Justin Weber is an admirer of McIntosh, and humble of origin; and second I have coveted McIntosh components since I was a teenager. I had a chance to purchase some used McIntosh equipment some time ago, and didn't....an opportunity lost. Some day...I do not consider McIntosh ridiculous at anything other than their incredible sound performances…the Kenzie falls into that category. When I found the opportunity to review the ampsandsounds products, I did not hesitate. After researching the company and knowing the affinity for McIntosh, I was in. Please don't take this as an insult that I would not have taken this opportunity without the tie, but knowing I could get closer to someone with the same affinities as I, made it an easy decision. Retail – $1,650 with NOS tube set. Cathode Bias/automatic bias allows for easy tube changes without adjustment. Compatible with 32 ohm-300 ohm headphones using the 32 ohm 1/4″ jack. Headphones above 300 ohms will benefit from using the 600 ohm 1/4″ jack. When I started, I used my iPhone 6+ through the Elear/Kenzie...and an almost deep foreboding sound ensued. The kind of sound, which once you hear it, it draws you into the darkness. Into that deep, deep cavern of unknown. An unknown you are hesitant to explore, but know you must. This is the true definition of "The Journey is the true meaning." 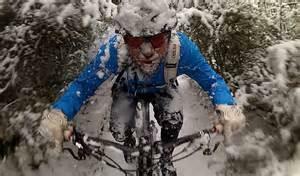 I remember one mountain bike ride I had many years ago in the winter. I hooked up with my local bike shop buds, and we drove to the Kansas River trails in Lawrence, KS. We had about 4” of fresh snow, it was about 31.5*F. I mention this, because those are just about the perfect winter riding conditions. Fresh snow, perfect “stiction” temperature, not too cold, not too warm. The synergy of this ride sticks with me so much, that as I recall this, I feel as if I am still on my Specialized Stumpjumper from that night. We didn’t “bomb down the trails,” but rather we reached such a high level of focus and concentration that we were traveling faster than had we indeed bombed down the trail. Mile after mile, hour after hour, we rode. If was well into an early Sunday morning before we succumbed to cold and hunger; a full six hours after we started. Throughout the whole ride, there were to us Zen-like moments of perfection. The perfect line chosen, the perfect gear, the perfect apex on a tough corner. It was just a mesmerizing, superb display of perfect oneness with our steeds. Throughout the whole of six hours, rarely did we talk, lest we destroy the synergy, the perfectness of the moment. We drove back to Kansas City, tired but with full bellies from some cheap QT grub, and did not speak. It is one of the top three mountain bike rides I have ever had; and this includes many, many rides and races in the mountains of Wyoming and Colorado. It was that perfect. I mention this not to brag, please accept my apologies in that regard, no not to brag; but to try and make you realize what the Kenzie did to anything I threw at her. That perfect synergy of music, quality of tone, and focus, sheer focus of that particular moment in time. THAT is what the Kenzie brought to my system, the same way that ride, on that perfect night did. It was just an incredibly intrinsic moment in time with the Kenzie, and I am extremely grateful to Justin, having experienced it. 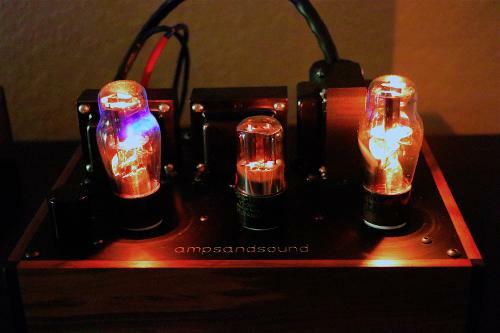 Top quality build and finish highlight the Kenzie, and who DOESN'T love the look of tubes! Somewhat confusing to me was that one reviewer says the Kenzie is warm and full. Another says fast & quick, while NOT being warm & enveloping. I think the sheer variety of listening experiences afforded allows for the discrepancies in verbiage. The Kenzie is simply the avenue, which allows whatever music is there to show. No fuss, no problem. I myself found the Kenzie to be warm and inviting; like a fine bottle of single malt in front of a fire on a cold night, such as I had after that night of mountain biking. What a marvel, and with immense memories, I recall both. The Kenzie provided that soothing warmth to almost ALL music I played at her. Very little was not at the top of the game. And to be honest, I won’t even go there because it could very well have been the recordings played. Just an old friend to come home to every night and enjoy. That trusty old dog, who is so loyal you eagerly anticipate the return home…that is what the Kenzie provided me. Listening to my excellent Nova via Lindsey Stirling & ZZ Ward in Hold My Heart through my MacBook Pro, the sound was full on vibrant, with a "hint" of more bass than I have heard through other Amps...also I did have a background hum...this happened on my Schiit stack too for historical notes, so I do believe it is through the Nova, that this occurs. Just a wonderfully vibrant fun sound I heard. Enthralling and quite enjoyable. Mind you, the Kenzie was not (to me) coloring the sound at all. As I understand, it was the mix of tubes, which provided the warmth by design. And I thoroughly enjoyed it. Hello from Adele was one of the few songs, which I did not enjoy the most due to a bass line that is a little too far forward. I think it is the recording, but this does not cover at all her voice, though. Just a phenomenal song heard through my MacBook/Kenzie/Elear combo. This combo is made for female vocals and violin...just superb. Someone Like You-Adele: I have goosebumps...I literally do…Just Adele and the piano live in Royal Albert Hall; one of the most iconic venues on the planet cements this combination. Adele/Royal Albert Hall=Elear/Kenzie. For some reason I am brought to tears by this. I think it is the genuine love I have for my wife, and this combination of Adele/Royal Hall/Elear/Kenzie that makes such an impact upon the sound. I am the luckiest guy on the planet right now...Even when her voice cracks a smidge, it is true, genuine and REAL. The way sound was meant to be. Set Fire to the Rain: Vocals and piano upfront again, drum/bass as the foundation. Strings again, alight in the middle, which holds the bass line and the Adele/piano combination together. This songs shows that the Elear/Kenzie allow the music to shine through. Not imposing a "false sense" of sound on the proceedings. There is nothing false about this. This is true music. This is true enjoyment. Another case in point is Anne-Sophie Mutter's excellent Zigeunerweisen Op 20: is pure classical and violin. This is what the Kenzie and Elear were meant for...oh my God... It is as if all in the audience are collectively holding their breath throughout the whole song...while magical, it is a hint too laid back for me, until the song hits the 6:45 mark. Then the finale finishes what has brought me to my knees. I think it is simply preparing me...slowly bringing me back into the fray. Preparing me for the finish...gently. Then the last 2+ minutes dispel any “thinness” noted above. Incredible. One of my favorite male vocalists is Dave Matthews, as well as Stevie Ray Vaughan (my all time favorite artist, God rest his soul), Matthews has a "soft-gravelly" quality, which compliments his music extremely well. Throw in a diverse group of musicians, and you have a diversity, which lacks in much of the music of today. It is almost like he is from another era. Gravedigger shows the passion with which his music was developed, coming from a slower start, building to a crescendo, and finishing with that sad, intimate, almost forlorn ending. You FEEL for those that died in the song, and the Kenzie portrayed this without protest. It was as if the reverence from the amp was a conscious decision. It's way of paying homage to those departed. What a respectful way it was. Follow that with Grey Street, and you have come full circle. This journey is like an experience where you must be brought down to the depths; then lifted out. There were times in which I would fail miserably during my two-day mtb races on the first day. I would have to dig deep on the second day to overcome this. With the help of my trusty Specialized Stumpjumper, more often than not I did. On a cold, wet snowy, did I say cold?, day in Lawrence, Kansas we rode the second day of the Kansas State Mountain Bike Championships many moons ago. Moving steadily through the pack, this was the muddiest race in which I had ever raced. I am proud of my 7th place out of 65. And I was the only one to ride up a particularly muddy section...I attribute this to not only my skill (which wasn't much), but also to the ability to read the terrain and I let the bike decide the route. Almost intuitively, the Stumpjumper guided me; much the way the Kenzie is now. Showing me the correct path to choose while allowing me the choice of music for the journey (I mentioned this in my Elear write up too, but for different reasons. The Kenzie was that steadying force, just like my Stumpjumper in the race mentioned above). A wonderful guide into the realm of Hi-Fi music, the Kenzie was. Dave Holland and Pepe Habichuela combine so well on the Hands album, this quickly became my go-to listen, along with pretty much anything by Lindsey Stirling. The title track, Hands is just a play on the emotions. Bass guitar and Flamenco combine seamlessly to concoct a sound, which really brings the strengths of the Kenzie out. Variety, solid bass, mids which compliment and hold together the two opposites while there is enough treble to satisfy ones needs. No bleeding of sound into the others territories. Each playing nicely, to combine into a sound, which puts you front and center. Intimate, almost sitting on stage next to each guitarist. The Kenzie really shines with string instruments, which to me are slightly dark by their natural sound. Just splendid, it is! My Fiio x3ii gives the Elear a straight forward sound. Kind of an analytical sound, which the Kenzie warms nicely. Almost a juxtaposition of sound smorgasbord...who wins? Well, I do right now! An interesting mix, which the Elear tries to meld into an elegant sound, but ends up slightly hollow in sound presentation. It is not the Elear's fault, though. I blame the almost antiseptic flat sound of the Fiio here. I really, really like the sound from the Fiio, but here it is just SLIGHTLY hollow and odd with some of the songs. The Kenzie does her best to warm up the whole scene, but the Fiio does not really want to accommodate that request. Not bad mind you, just not my favorite. Then other songs on the album and well, they were just right. Still quite acceptable, but not the weeping, teary-eyed emotion which the MacBook/Kenzie brought. Highs are better positioned and of a clearer nature, but at the cost of that lack of....fullness. Maybe it is the true nature with which the Kenzie allows the sound to my ears. No hiding behind a false presentation. Elements-Orchestral version, by Stirling is just a “holy buckets” moment. This must be what the top truly sounds like. So deep, so spatial, so clear and vibrant, that my jaw slackens a bit, not in jealousy, but a wanting to jump wholeheartedly into the music, like no song has through the Kenzie up until now. And the other songs have been damn bloody good. I had to stop listening for the night after this song. It was too much. Incredibly sensuous and surreal, my breathing quickened, as did my heartbeat…. I truly felt like I was in Transylvania. Hearing the beat of the cloth mallet on the "pipes" has never felt so real. I was INSIDE the head of the mallet. Every instrument so precisely placed, that I dare not breath, lest I disturb the smallest Ion in this sphere. This song truly defines a sense where intimate sound stage is desperately OK. Menacingly perfect. No sense of flaw is present, and you dare not disturb that aura. I could go on, but I hope my scribble and thoughts have conveyed what a genuine prize the ampsandsounds Kenzie is. It truly was an honor to be part of such a high level loaner-tour. This is the reason I have come back to audio, and Head-Fi-type audio, so that I may enjoy the wares of the craftsmen who share their enjoyments with us. Share their hard work with us, so that we may have options. So that we may choices, which fit our every “need.” That said, I can honestly state, that the Kenzie is on my final list of tube amps should that open up to me (after the kids are out of College, sigh…). Justin and his crew should be very proud of their efforts. I would feel extremely comfortable recommending this amp to anyone, not just those who are in the market for a Summit-fi amp. It is that good. The Kenzie is indeed the anonymous money behind the project, and she does not mind. Thank you, @ampsandsound, thank you Justin, and best of luck with your continued success! It was my honor to be present. Stegemans and JoeDoe like this. 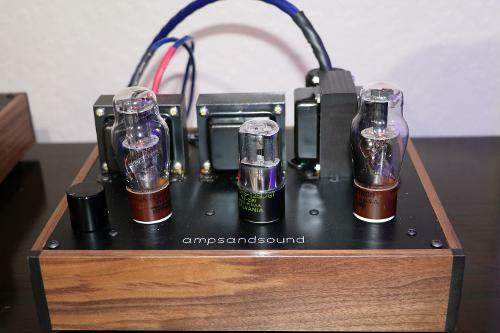 Very powerful, versatile tubed headphone amp, ampsandsound Kenzie! Pros - Power, clarity, exquisite detail, beautiful! Cons - Price... Fair but not cheap... Really is a pro, nothing is cheap about this amp! would drive my Ethers as well as my Grados. I know Justin to be honest, and did not doubt him, but holy cow! and contrasts. It took me a while to enjoy it but it will grow on you if you open the door. Next I listened to Big & Rich Greatest Hits, great country rock with contrasts. I listened to my Grado PS1000, PS500, Mr. Speaker Alpha Dogs and Alpha Primes, and with each of them could not find a note or whisper less than perfectly performed. display of the music with my large Tannoys. Transcendance 8+ pre amp for tougher loads. They are still great but the Kenzie is stronger, beautifully. I need to sell some gear and will have my Kenzie soon. A silky smooth midrange, detailed and balanced sound signature make the Kenzie an excellent tube amp. Pros - Silky smooth midrange, wide soundstage, detailed and well balanced. With my head laid back, eyes closed, and feet tapping to the beat, I can’t help but be thankful for some of the audio equipment that I have. Thankfully, Justin Weber, owner of Ampsandsound, is a text message away. This isn’t the first time I text him to compliment him on the Mogwai, but it continually impresses me. 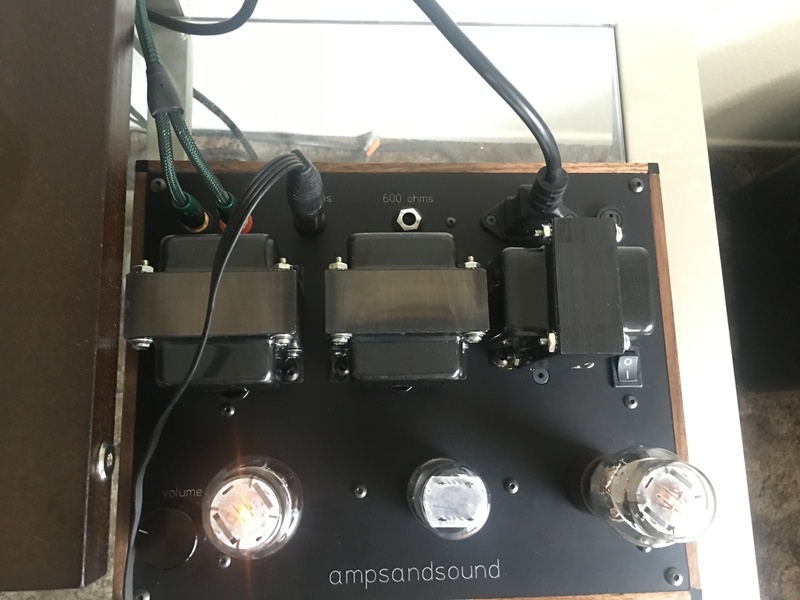 The Kenzie was the only Ampsandsound amp I didn’t get to demo at Canjam. It is a dedicated headphone amp, named after Justin’s daughter. The confidence he exuded in the Kenzie made me chuckle, after all I already had the Mogwai, but it also was too intriguing an offer to pass up. As I unpacked the Kenzie, it was a good bit smaller than the Mogwai, and I was concerned it would not be able to power my LCD-4s. I set it up and let it warm up, plugged in my headphones and turned the volume up. It had a sweet sound signature, but I enjoy listening at higher volumes, turning it up, the sound eventually began distorting. Thankfully, the Kenzie arrived at an opportune time, as I had a local headphone meet with some friends. At the meet, I was itching to get my hands on an LCD-3, HE-1000, and HD800, all available and ready for the Kenzie. The Mogwai and Kenzie were both demo’d with a combination of headphones, and everyone preferred the sound signature of the Kenzie. One described it as more balanced, compared to the Mogwai’s warm and more bass heavy sound signature. Another raved about the mid range. One who paired the HE-1000 with the Kenzie called it “a treat”. I was fortunate enough to have some time with the HE-1000, HD800 and the LCD-3, but it wasn’t enough, I offered my friend my LCD-4s for his LCD-3s so I can really get a feel for the Kenzie. Suffice it to say, I didn’t have to twist his arm too much to broker that exchange. Once in the comfort of my own home, I unpacked the LCD-3 and got a few hours in with my Mogwai to get a frame of reference. For this review, I used a Macbook pro streaming Tidal, Chord Dave, all power cords, USB and RCA interconnects are Nordost Blue Heaven cables. I had planned an extensive A/B testing and comparison between the Mogwai, and eventually the Chord Dave. After I began listening to the Kenzie however, it was clearly apparent the differences in sound signature between it and the Mogwai. Kenzie indeed has a tight, accurate bass, but it wasn’t over extended and did not bleed into the bass as the Mogwai had a tendency of doing. It had more detail and more treble extension than the Mogwai, cymbals had an extra sparkle to them. It has wonderful resolution, clear and detailed. The silky smooth midrange transitions into the treble so effortlessly. The extensive A/B testing was quickly abandoned as I let the Kenzie roll through my playlist, it would have been a misdeed to interrupt the enjoyment for the sake of a comparison. From Bill Wither’s soothing voice, to the guitar and cymbals in Clapton’s Layla and Tears in Heaven, Nirvana’s Lithium and Teen Spirit, my eyes were closed, there was a smile on my face, and from time to time, shivers down my spine. The Kenzie and Mogwai share the same design, but rather than Speaker outputs along with a 1/4 inch 32 ohm input, the Kenzie has two single ended 1/4 inputs, one at 32 ohm, the other 600 ohm. All my listening was done on the 32 ohm. The input tube sizes are 12SL7 flanked by two VT137 output tubes. As with the Mogwai, all input and output connections are on the top plate towards the back. Tube replacing and rolling is very reasonable, as a trio of new tubes can cost less than $20. Now the only knock on the Kenzie is it isn’t as powerful as the Mogwai, so if you own or plan on owning an LCD-4, HE-6, JDS Abyss, you might want to look elsewhere. However, for almost any other headphone, the Kenzie has more than enough power. The Kenzie has a balanced sound signature, with a wonderful midrange, and wide soundstage. It had excellent synergy with the HE-1000, LCD-3 and HD800. I couldn’t help but chuckle as I sent the check, followed by a text message to Justin Weber telling him he was right, the Kenzie would not be going back. Now the decision becomes, Focal Utopia or HE-1000 v2. Justin Weber, my wallet does not approve. JoeDoe, Furiousipaduser, DoctaCosmos and 1 other person like this. Disclaimer: I purchased this amp after auditioning it at Canjam Socal. This is my honest review. The ampsandsound Kenzie Headphone Amplifier is simply an incredible-sounding headphone amp. It offers amazing performance at a fair price, with a lifetime warranty. I had been looking for a replacement for my Oppo HA-1 for quite a while. I had recently upgraded my DAC to a Schiit Gungnir Multibit and was on the hunt for what I thought would be a balanced amp; probably a Schiit Mjolnir 2 or something similar. I wanted to be able to tune my sound with tubes and had grown slightly bored with the down-the-line neutral take that the HA-1 offered. Enter the ampsandsound Kenzie Headphone Amp. (yes, that's how it's spelled, small "a" and all). The Kenzie headphone amp is derived from Justin Weber's original Kenzie speaker amp. He decided to take the well-regarded Kenzie design and modify it strictly for headphones. The KHA has two dedicated headphone jacks: one optimized for 32 ohm headphones, and one optimized for high impedance headphones. I asked him what the actual output impedance was on the 600 ohm jack and he said it's in the high 200's; so this option will be better suited for the Beyerdynamics of the world rather than Sennheisers. Feel free to experiment as you like, though. I tried out the Beyerdynamic T1 second-gen, and it was very pleasing: plenty of thump in the bass and excellent clarity. I would suggest using Sennheisers such as the 6xx series and the HD800s with the 32 ohm jack: it gives a better balanced performance. The bass can get a bit wonky out of the high impedance jack. Justin is not overly worried about benchmark specs and buzzwords in his designs, but he is open to any questions you may have of him. I've got to give a plug for Justin's customer service: it is in a word, awesome! Feel free to send him an email with any questions you may have and he will give you candid and informative feedback. He will go out of his way to earn your loyalty. I've had the opportunity to correspond with him via email and in person, and he's a great guy and designer who is incredibly enthusiastic about speaker and amplifier design. BTW, Justin was very generous when I met him at Canjam. I didn't currently have the cheddar to purchase the amp at the show, but he took an interest in the HA-1 I was selling to use as a dac at home. In short he took the HA-1 off my hands and gave me a generous credit towards the Kenzie, which made all the difference. Thank you, Justin. Thrice over! The Kenzie comes supplied with two NOS (new old stock) 1626 power tubes and one RCA 12SL7 input tube. This "stock" configuration is extremely compelling, and I doubt many buyers will feel the need to roll other tubes in to rectify perceived flaws: this amp sounds amazing right out of the box! Clean, extended treble without a hint of harshness. awesomely textured mids with just a slight lower-mid emphasis, nothing too "warm" or any other tube clichés. The bass is not accentuated at all; it's clean, hits nice and has great texture. I would describe this amp as neutral with a hint of tonal warmth. Tracks (or albums) that I used for this review were from Moving Pictures (2015 remaster) from Rush, Volto! Incitare (an amazing heavy rock/jazz fusion album), Metallica's Black album(24/96), John William's Star Wars: Return of the Jedi Soundtrack, Beethoven's 5th conducted by Carlos Kleiber, and Meliora by the faux-occult band Ghost; this last one falls into the heavily compressed category. The LCD-2's are known for having a mid-centric tilt with a slightly recessed presence region. That being said, I really enjoy these headphones with classical music. Some LCD-2 users describe the treble as slightly "grainy" for lack of a better word; I understand that description, but don't find that to be the case with the Kenzie HA. Listening to Return of the Jedi's Main Title, there is plenty of "air" present in the mix without getting weighed down by the midrange and lows. Similarly, Beethoven's 5th symphony, as conducted by Carlos Kleiber and performed by the Vienna Philharmonic, is an exercise in dynamics with gentle, quiet passages and explosively loud bombast. The overall tone falls on the heavier side through the Audezes, but that's just a matter of taste. Try these tracks with some Beyerdynamic T-90's or T1's, and you'll have all the air and presence you could possibly want. Rush's Moving Pictures is a spectacularly well recorded progressive rock album. With great separation between the drums, bass and guitars, the speed of the LCD-2's planar drivers and the tone of the Kenzie shine through. On YYZ, the drums are lightning fast, the bass rock solid with great extension, and the guitars just simply sing with no peaky-ness or stridence. The Camera Eye is a 10-minute epic with a ton of layers. Keyboards, electric guitar, acoustic guitars, bass and drums combine to make a great test for amp/headphone pairing. The Kenzie/Audeze combo pull it off nicely. On the more compressed modern side of things, Ghost's Meliora is their now-signature album, with their best songwriting to date. While the album is very well produced, the mastering is pretty loud, and there aren't a lot of dynamics. The Kenzie extracts all the great guitar textures, distorted bass tones and hard-hitting drums and makes them sound their best, while taking a bit of the edge off the hot mastering. On lesser amps, the cymbals can come across extremely dry and a bit harsh. Papa and the Ghouls have never sounded better. Volto! is a jazz/rock fusion band that caught my attention back in 2011. Danny Carey of Tool mans the skins, John Ziegler is on guitar. They are accompanied by Lance Morrison on bass guitar and Jeff Babko on keyboards. Incitare is essentially a live-in-the-studio effort (with a few overdubs here and there). This is not a particularly dynamic record, but there are places where the volume drops, then kicks you in the face, such as "Drumbeaux", which starts with a Danny Carey drum solo, then explodes into palm-muted guitar wailing. Another favorite of mine is "Gillz" which starts off with a mysterious, chorus-laden, clean guitar tone. Ziegler brings on the mellow arpeggios, then kicks in the overdrive to bring forth an incredibly melodic lead. Lance Morrison supports the entire album with rock-solid, subterranean bass. Jeff Babko is also great on the album: trading leads with John Ziegler throughout the album in a fun back-and-forth jammy vibe. In conclusion, The Kenzie Headphone Amplifier is, in my opinion, a world class piece of headphone gear that will likely make you a happy audiophile for years to come. You have the ability to tube-roll to your preferences, it comes with a lifetime warranty, and it sounds absolutely superb. I think a lot of potential buyers looking at stuff by Cavalli and Woo Audio should take a look at ampsandsound; I think you'll find performance that rivals the big boys and spend a lot less than say, a WA5 le, Liquid Crimson, Gold, or Glass. Edit: Justin informed me that the output impedance of the high impedance jack is actually 600 ohms. JoeDoe and Luckbad like this. From the hundreds of threads / posts / reviews / discussions I have seen the HD800 has a reputation as Bright, with thin bass and maybe analytical, I have found anything but that to be the case. JoeDoe, desik, Snowpuppy77 and 1 other person like this. Thank you for the feedback. Now that the HD800 S has been released the regular HD800 have come down in price considerably. They are the same price as the Beyerdynamic T1. It is a tough decision. May need find a way to audition both. Have not ruled out the HD700s either as I have read that some prefer it to the HD800.